The Dell Chromebook 13 is one of the best premium Chromebooks featuring better-than-typical build quality and faster hardware than the majority of its Chrome OS contemporaries. The Intel i5 processor delivers much better performance, but this comes at a much higher price than many other budget Chromebooks. It is a 13-inch Chromebook designed beautifully for business-class performance and fast access to the cloud. This Dell Chromebook 13 is made of aluminum and has a carbon fiber touch at the top. The backlit keyboard on the Dell Chromebook 13 is very clicky and responsive. It is one of the best keyboard I have ever used on a Chromebook or a notebook not called Macbook Pro. Same goes for the glass trackpad. Simply put, Dell’s machine easily puts Windows computers hundreds of dollars more expensive on notice. This is big milestone in Chromebook design. Build quality is Macbook Pro-like and it looks great in my opinion. The carbon fiber lid and dark grey metal of the base not only look stylish, but feel rigid, robust and very well made. It’s not all unforgiving metal though – there’s a soft-touch rubbery material on the palm rest for a bit of warmth. You will notice the higher build quality in this Chromebook almost instantly. The Dell Chromebook 13 features the industry’s newest 5th Gen Intel® Core™ i3 processor for optimum productivity. There are a couple downsides to buying a Dell Chromebook 13 7310. The speakers are bare bones and iPad Air 2 and smartphones surpass. It almost sounds like the speaker blew out as it rattles during playback. This combined with the inability to download Spotify makes for a mediocre audio experience in all honesty. Android coming to Chromebooks will change this. Enough cannot be said about how great of a Chromebook Dell has produced. With the Dell Chromebook 13, Dell has managed to produce a stunner of a Chromebook, and unlike Google, it’s done that while sticking to sane, attainable pricing (The Google Pixel is one of the most expensive Chromebook). It ranks best in class on nearly every front, even compared to favorites from Toshiba, Asus, Acer, and Samsung. The Dell Chromebook 13 is a great looking little notebook that, at first glance, is almost indistinguishable from other brands of business class systems. It offers strong performance and is ready for both work and play. Buyers may also be interested in checking out the ASUS Chromebook Flip for a similar experience, but a smaller screen. The newly designed Dell 13″ Chromebook built specifically for small business customers in mind. 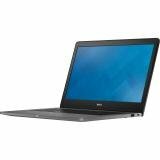 Includes an Intel® Celeron® processor with a Chrome OS, easily connecting your business to the cloud. Multiple configurations fit a variety of price ranges ($400 – $900). If you go for the Intel Celeron version, you get a highly premium Chromebook for less than half the cost of a Chromebook Pixel. Higher configurations are pricey. The cheapest option is $399 with only 2GB RAM, while the most expensive option is $899. There have been a number of audio jack issues reported: It requires a lot of force to plug in headphones and audio cuts in and out a lot. A little heavier than most 13-inch Chromebooks. The brick charger is also rather large.